Sinus Iridum — the Bay of Rainbows — is visible near the north part (left in my sketch) of the terminator. It’s the little half circle. The Jura Mountains ring the western edge and catch the morning sun. It looks like a smile. This is one of my favorite lunar features to view and also to sketch. Mare Imbrium is the large lunar mare just south (right) of Sinus Iridum. As the moon approaches full, the large craters Copernicus and Tycho take center stage. Moving left to right across the terminator we first see Copernicus. It’s 93 kilometers in diameter and its rays will be much more visible at full moon, thought they are impressive today, too! Tycho lies in a field of craters near the south limb. Its massive ray system is beginning to appear. Watch it over the next few nights and trace the rays as they span over 1500 kilometers. Its diameter is 85 kilometers, which makes it a little smaller than Copernicus. Closer to the terminator, another crater with spectacular rays at full moon appears tonight as a little white crater circle between Copernicus and the terminator. That’s Kepler! Oval Mare Humorum appears directly opposite Mare Crisium, and the look to be about the same size, which they actually are!. 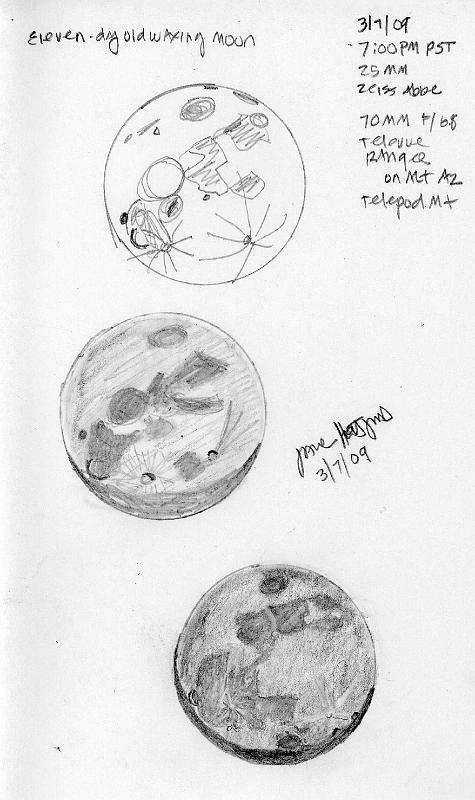 The small crater on the left edge of Mare Humorum is Gassendi, another lunar feature I love to sketch. Shickard is the final lunar feature on the right terminator. Wow! That was a lot of fun, to try to identify major features on a tiny 2-inch sketch! Full moon next!